The minor league review is going to be harder for me to do but I will do my best with it. AAA Starters:Phil Hughes,Ian Kennedy,Chase Wright,Alan Horne,Kei Igawa There is a chance of course that Phil Hughes ends up in the major league rotation. I look for Phil to have a great year,if he stays healthy i still think he will end up helping the Yankees sooner then later. Ian Kennedy is interesting,he has pretty good stuff but has to have his control to be successful,i think with him you worry more now about his attitude but he is still only 24 yrs old as of yesterday. He is having a great time in the Puerto Rican Winter league: 2-2,1.56ERA,34.2IP,19H,12BB,31K. Hopefully he can translate this success into AAA next year and who knows maybe we will see him again at some point. As for Chase Wright he pitched very well in AA last yr, should of been in AAA but there just wasn't a spot for him so it will be interesting to see how he does and Alan Horne is coming off of TJ surgery so it may take him a while but he is feeling good now and will be ready for Spring Training, hopefully he bounces back and is back to being a top prospect. Igawa isn't even worth mentioning to me, the Yanks have desperately tried to get rid of him but can't. I would watch for Dellin Betances,Zach McAllister,Andrew Brackman,Jeremy Bleich in the minors this year-all have great potential and will be interesting to see how quickly they develop. Bullpen:Mark Melancon,David Robertson,Jonathan Albedejo,Stephen Jackson,Humberto Sanchez,Kevin Whelan,Anthony Claggett. The Yankees are loaded with arms and it will be interesting to see who goes where,some of these guys like Melancon,Robertson,Albedejo all have a chance to be with the big club, if not right away at some point during the season. Some of these guys may be in AAA or could be AA. The Yankees are in very good shape here all around. I would like to see how Sanchez does in a full yr coming back from TJ surgery, he was one of the top prospects in all of baseball a couple of years ago. Kevin Whelan and Claggett also came over with Sanchez in the trade for Gary sheffield and had great yrs last yr and shown lots of promise. I thought since it is a dead time now, long winter ahead I would start looking position by position at how the Yankees look. I am starting with the Pitchers since that is position 1 on the scorecard. I will do the major leagues,AAA,AA and other guys to watch. Starting Pitchers:1.CC,2.AJ,3.Wang,4.Petitte,5.Joba This is how the starting rotation should look,I know Petitte hasn't resigned yet but its inevitable according to several reports and on MLB.com. If this rotation stays healthy this is the best rotation the Yanks have had in a long time. 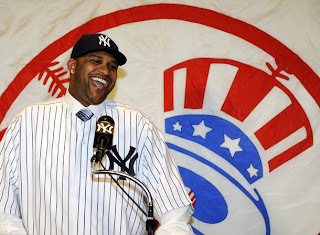 CC is a horse a true ace that they have been looking for, forever. AJ has ace type stuff and if healthy can definitely dominate, the good thing about him is, he pitches his best against the AL East and he can't beat the Yanks anymore. He already has said he can't wait to pitch against and beat the Sox. Wang is now your 3rd starter, he is only the guy who has won more games then any other pitcher in the last 3+yrs. Petitte as a fourth starter is solid, gives you innings and is a competitor. Joba chamberlain I have as the 5th starter just because they have to get creative with his innings and as a 5th starter they can skip him, i do still think there is a chance he ends up in the bullpen but for now I will leave him here. Joba as we know has the potential to be an ace himself one day and he is the 5th starter WOW. The Yankees may have the best rotation in all of baseball and pitching wins, so lets all hope they stay healthy and we will be looking at a great season, a chance to win day in and day out. Bullpen:Mo,Bruney,Marte,Coke,Veras,Ramirez,Aceves The bullpen is a little harder to figure out, we know Mo is the closer,Bruney is one of the main set up men along with Marte, I believe Coke will be there also but could go back to being a starter in the minors. Veras and Ramirez both made great strides last year and could be back and Aceves looks like a good bet to be the long man. The Yankees have a lot of people that can maybe make it but may be in the minors also, they are stacked with pitchers. I see this bullpen as very good with Mo, bruney,Marte in the late innings may also be the best in baseball. Coke is fascinating as another lefty in the pen but can also be a starter,spot starter or long man, we will see what they do with him. Here they are the top 2 pitchers in the starting rotation. I thought this was a great shot at the New Stadium, where they will be spending a lot of time over the next few years. If these 2 can stay healthy man the Yankees have two top of the rotation ACE type pitchers. This should be a fun time. If anyone wanted to know about the type of person Sabathia is, i think this is a great story. At the end of the year when he was making those starts on three days rest his agents kept calling Doug Melvin the brewers GM and saying you cant do that, he is going to get hurt and he cant get hurt, he is a free agent and all of that. CC caught wind and you know what that man did, he called his agents and yelled at them, dont you call that man anymore, im doing this, so he put the team he was not on long for ahead of his own personal self, i think that is great, he is a great pitcher but more important a even better human being and by the sounds of it AJ sounds like a pretty good guy himself,lets hope it works out the way we think it can. As we all sit here today waiting for the snow and thinking of how much we are going to have to shovel remember this. There are only 56 days until pitchers and catchers report to George M. Steinbrenner Field in Tampa,FL. That is something to warm our hearts and minds as we go through this gloomy winter. This winter seems to just get better for the Yankees and their fans. I wake up this morning and the Red Sox have issued a statement that the are pulling out of the Mark Texiera sweepstakes. I hope this is true and he just signs with the Angels or one of the bad East Coast teams or maybe the Yanks can swoop in and take advantage of this situation. I dont believe anything until its official, this can be a bargaining tool, calling Boras bluff but i think in this case he really does have other teams and offers involved. This is going to get interesting. I couldn't leave out the wives,enjoy fellas. I think they are attractive females what do you guys think? There is a report coming out of Boston and on mlb.com that the Red Sox are in final talks with Tex and may sign him tonight or tomorrow. Lets wait and see if this is true, i hope not, i mean i want Tex just as much as anyone but am starting to realize the Yanks aren't getting him and although the Sox will be helped greatly by him remember they have to trade Lowell and this could cause problems in Spring Training. Everyone just relax the Yanks could still get Manny and also Pitching wins and I believe the Yanks now have the best pitching in the division and league. CC- "I think it adds an urgency to get back to where this organization is supposed to be." "I wouldn't say its pressure, i would say people will play with a sense of urgency in the new stadium getting back to that. It's definitely exciting. Hal Steinbrenner-"People are excited,that much is obvious." "People are excited about the new stadium. Going out and getting these 2 great guys is going to be exciting too." AJ-"This is a dream come true. Im looking forward to it, its going to be a fun ride." "We are all family now." Cashman-"The one thing that I think today represents is we are going to keep swinging for the fences." Joe G-We got the two gentleman we really wanted,im proud to say they are Yankees. The Press conference was well done,plenty of press of course. I think the two men handled it very well. They both said they care deeply about winning and the Yankees give them the best chance of achieving that year in and year out. They both admitted that the money is good and helped make the decision also. The wives are both very good looking and seemed happy. Serena Girardi-Joes daughter presented them with Roses to get the conference going. CC said he feels good and he appears to be in very good shape. AJ said he has learned how to take better care of himself and thinks he is past all the injuries now. They both said they have great support with each other, wang,MO and Joba and then ARod and Jete. I know everyone is going to get crazy with Manny and Tex maybe going to Boston but even if they dont do anything this helps them get to where they want to get, remember everyone pitching wins, and boy do they have that now. Here are some of the pics from todays press conference. I think they both look good, man CC had to lose some major weight he really looks good. I think they both did a great job today. The Yankees released a report out of Tampa today regarding there catcher Jorge Posada and fiery leader I might add. He threw from 60 feet today for the first time since his surgery. He completed 75 throws, 3 sessions of 25 throws each. He reported he felt good. Captain Derek Jeter was on the MLB home plate channel on XM radio. He had this to say regarding AJ and CC. "Its going to be fun, I mean CC we have had plenty of battles with in Cleveland. I think the thing that sticks out with him is he is always out there he is a horse. He throws a lot of innings, a power pitcher. With AJ we saw too much of him this past year, it seemed everytime we played Toronto we faced him and Halladay and they beat us more oftenthen not. It will be fun to finally be playing behind him. We added 2 guys, 2 power pitchers, there stuff is as good as any in baseball." He also spoke about AROD and his decision to play for the Dominican in the WBC and about Posada, I will add more quotes later on. CC Sabathia was touring the new Yankee Stadium getting ready for his introduction to Pinstripes tomorrow afternoon. I have pictures on the right courtesy of the New York Yankees and Peter Abraham of the Journal News and http://yankees.lhblogs.com. I should be posting more pics tomorrow from the press conference and quotes. This is going to be a shameless plug but this is my blog, for anyone that doesn't know I will be on Peter Abrahams blog pinch hitting for him in January, i will give more details as they become available. Did anyone notice that he is sincerely smiling,who wouldn't with a 161 million dollar contract but also, he looks pretty slim to me. The New York Yankees will throw out the red carpet tomorrow afternoon at the Old Stadium. They will be unveiling there 2 prize free agent pitchers CC and AJ as we will be calling them around here. The press conference is set for 1:00PM, i am sure YES will be covering it. I am very excited for this and cant wait to see what they have to say. This should be the last business held at the old stadium as the Yankees are scheduled to be moving across the street to the new stadium in February. The Mets unveiled there new closer today,he kind of makes me root against the Mets should be fun having 2 opposite closers in NY the great and classy MO and then the flamboyant and obnoxious Krod. I hope to have some quotes from the press conference and maybe pictures tomorrow. The Yankees still have some work to do. The talks for Mike Cameron have stalled but i still think this will get done. Kei Igawa seems to be in the deal now along with Melky and to me that is addition by subtraction by just ridding themselves of the legend that is Igawa. I dont know what is taking so long but hopefully Petitte will accept the offer eventually and be back as the 4th or 5th starter depending on how you look at it. The Yanks really do need a bat to protect Arod and I really love Tex as is well known but I really can see them going after Manny. It looks more and more like Tex will end up in Anaheim or heaven forbid Beantown. I think the best thing that could happen is Tex signs anywhere but Boston and the Yanks get Manny, I really hesitate to wanting him but man it would be fun to see him torture Boston and WOW what could him and Arod do together. It is that time of the year where it can be pretty slow. 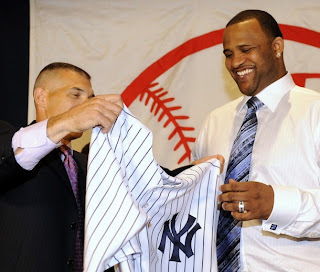 CC is in town and hopefully we will get his press conference by Thursday and AJ to follow shortly after. If you are a Jets fan your happy but boy did they get luck yesterday. The Jets dont look good at all and if not for a dumb head coach who was running the ball all day decides to throw and the QB fumbles for a TD to the Jets and the game. The Jets still have a lot of work to do, i dont think anything is a given, they should beat Seattle but they do have to go to the west where they are 0-3 this year. The Jets have to thank there lucky stars for winning yesterday. Brett Favre has to scare you when after the game he says maybe i just dont have the arm strength I used to have while making the excuse for throwing an INT. This is going to be a fun last couple of weeks. The Giants played another bad game in Big D last night and were beat. I do think they miss Burress but I also think Jacobs has been resting the last 2 weeks to get better and should be back this week and then for the playoffs. I do think the Giants need the running game but also use hurry up or Shotgun to get things going. I think the Giants will come through next Sunday night at home against Carolina. Dallas has to win both of their games to make the playoffs but it would of been nice for the Giants to knock them out. The Giants need to win this game get the 1 seed and not have to worry about that final game. Pittsburgh and Baltimore played a fantastic game that was for the division. Pittsburgh was down in Raven territory trailing 9-6 and I believe it was fourth down but I could be wrong. They threw a pass that was caught with the recievers feet in the endzone but he caught the pass facing the quarterback clearly on the one yard line maybe a little closer but no doubt that it wasn't across the goalline. I dont know what these Refs are doing but they reviewed it and overturned the call on the field which ruled it down on the 3 inch line. The more things like this happen I cant help but think there is some kind of cheating or fixing going on. Ok, now im back to watching the Giants game, be back later or tomm. I dont think there was too much suprise in this one but Sam Bradford the quarterback of the what looks unstoppable Oklahoma Sooners won the Heisman. He won in a landslide. He is only a sophmore and lets hope he comes back for at least one more season. The Texas longhorns QB finished second.